This chapter demonstrates about the SVG Filters which is defined by the <defs> element. Filters are referenced by the graphic elements by using their ID’s following are the concepts covered in this chapter. 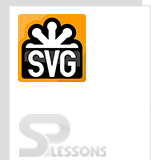 SVG Filters are defined by their ID’s and which are defined with in <def> elements. SVG have several types of filters following are some mostly and commonly used filters listed below. SVG Filters are supported by all the latest browsers, following are the browser versions supported by SVG Filters. 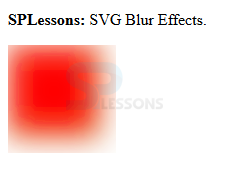 SVG effects are mainly defined as two types those are the Blur Effects and Shadow Effects Which are defined in <defs> elements. The elements which are defined in <defs> those are treated as a special elements like filters. Blur Effect is defined with the <feGaussianBlur> element. To blur some part of the image user need to use the stdDeviation attribute. The <rect> element links the element to the “f1” filter. The code below demonstrates the SVG Blur. In order to create the drop shadows user need to use the <feOffset> element which can be used to move image little bit in the same plain. 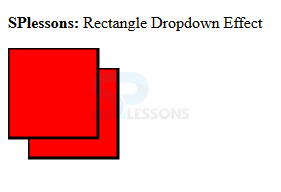 The code below demonstrates the offset rectangle i.e drop shadows effect. 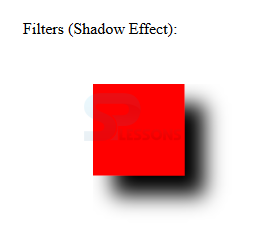 The code below demonstrates the filters with the shadow effect as shown below. <rect x="100" y="100" width="90" height="90" stroke="red" stroke-width="3"
Filters have the unique ID Attributes. Filters are referenced by graphic elements by their IDs. If multiple filter elements are present can be defined as filter 1 and filter 2.